It was cold and I was hungry… and had just left the New England Mobile Book Fair — so what better place to stop for lunch than another regionally named locale? 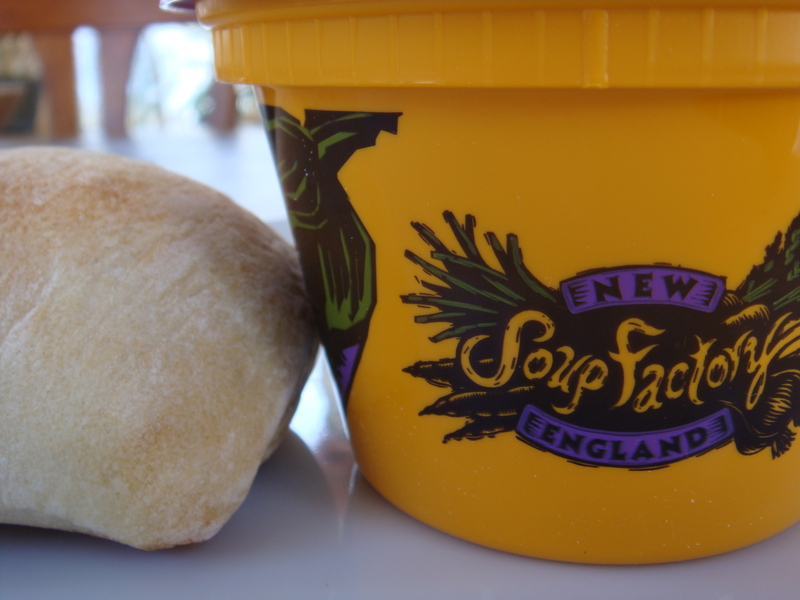 That’s right, I headed right to the New England Soup Factory (in Newton). I used to work in Brookline Village (and actually lived there for two years as well) and often went to the NESF for lunch. In fact, if I remember correctly, it was my first “in town” meal when I bought my condo there. The soup is consistently good and changes daily (with over 150 varieties)… and they also have salads, sandwiches and home-baked goods. Their online menu gives you a glimpse of what they offer and also provides links to the updated-daily Brookline and Newton special soups of the day. Since I hadn’t been to a NESF in ages, I was thinking that I would go with one of their standards — and one of my all-time favorites — the Corn and Clam Chowder. It is SO good… a twist on the classic New England Clam Chowder, with the corn and whatever seasoning they use adding a nice sweetness and a popping crunch. Once I walked in though, I was thrown… as several of the daily specials sounded delicious. I stared for a few moments, walked up to the counter… and was on the verge of forcing myself to decide when… the woman behind the counter says “I know what soup you want.” Hmmm… is she a mind reader? Does she know something I don’t know… because I still haven’t decided. I take a sip of the soup sample and…OH…MY…GOD. How the heck does this woman do that??? I knew as soon as I left that it was either the owner of the store or someone who has worked at the place for a long time… because it is definitely a talent to guess what someone is going to eat and be right! Especially because most of the soups on the menu that day were non-vegetarian… and she not only picked a soup I would eat, but one that I loved! The soup was phenomenal… and it’s not many soups I say that about. 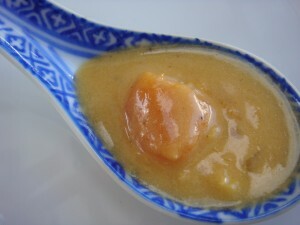 It was sweet, creamy, savory and scrumptious… all wrapped up together into one spoonful of goodness. When I was finished, I decided to do a little research to see if I could figure out who this soup fairy was… and I was right — it was the owner (and founder) — Marjorie Druker. You can read all about her at this link… as I found her bio on a website called How2Heroes — Cook. Eat. Be Merry. It’s basically a “how to” site for cooking… it’s very cool. 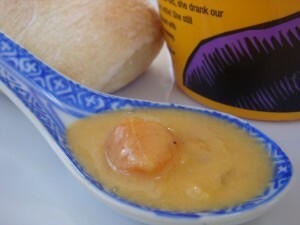 There is also a page on the NESF website where Marjorie shares some of her recipes. 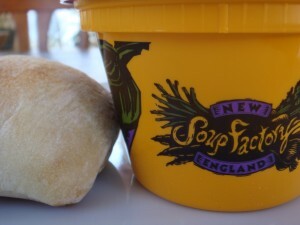 Lastly, she has recently come out with her own cookbook — The New England Soup Factory Cookbook. If it has even half the recipes they sell, it’s well worth it.